In the surrounding area to the west of Ronda, from the Sierra de Grazalema south through the Los Alcorncales Natural Park, you’ll find an unusual tree that locals use for making cork. 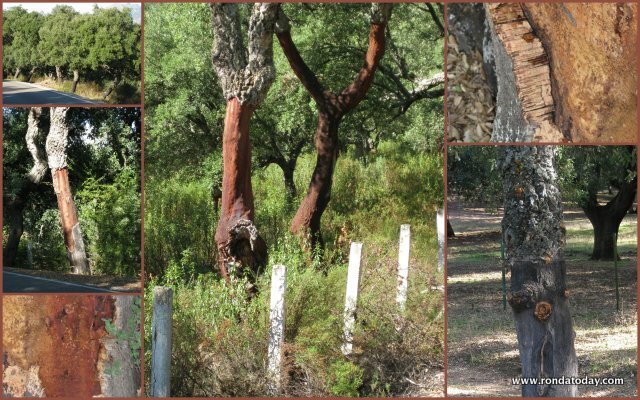 It is the cork tree Quercus suber, native to the Mediterranean, but harvested extensively in Western Andalucía. In truth, the casual nature lover might at first glance assume the cork tree is an ordinary oak tree, with a similar dark coloured knobbly bark, at least this is what many travelers tell me when I encounter them. However, if you’re in the area shortly after the bark has been harvested you’ll quickly spot the difference. The majority of harvesters will only remove about 1.5 to 2 metres of bark starting about half a metre from the ground. 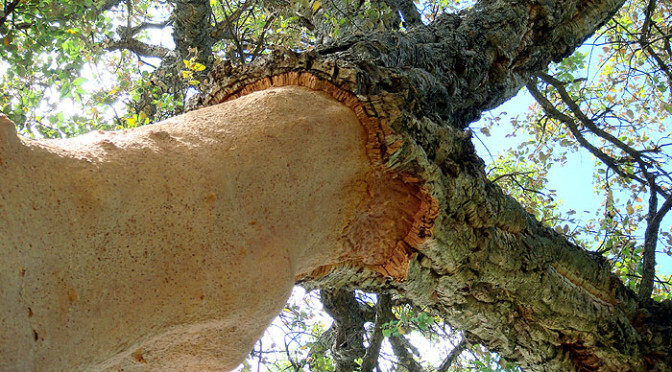 Taking too much bark can damage the tree since it is an essential part of the cork tree’s defence against fire. The summer months in Andalucia can be scorching, and the bark also helps maintain the tree’s stores of water. After it is removed, the bark is soft and springy and children love to roll it around in their hands to see how much they can compress it. The processed cork is broken up and compressed and glued to form the cork sheets used in flooring tiles, gaskets, and the most well known, champagne stoppers. The original invention of cork stoppers is credited to a Benedictine monk, Dom Perignon, whose name is used by Moët & Chandon on their premium champagne. Sadly there is no evidence he invented the cork stopper. You will however struggle to convince any cork harvester of this. The Quercus suber is only able to be harvested approximately every ten years, and a mature cork tree of 50 years is needed to make bottle stoppers. Since the tree isn’t not cut down, cork forests can be left to nature for the most part, and have been known to live to more than 200 years. The ecological benefits of cork cannot be understated, this truly is a renewable resource that allows for a complex eco-system of insects, reptiles, birds, mammals, and other flora to survive more or less uninterrupted by humans for centuries. With Spain and Portugal together accounting for the lions share of global cork manufacturing, the financial benefits add to the ecological, and should be encouraged. so the next time you buy a bottle of wine, make sure it has a cork stopper in it.